Restrictions: Valid Monday -Thursday ANYTIME. Friday - Sunday AFTER 1 pm. The Links at Greystone joined our program in 2016. The discount they offer our users is $40 for 18 holes WITH cart. Standard peak rate without the coupon is $60! The deal is valid Monday through Thursday ANYTIME and Friday through Sunday AFTER 1 pm. Please be sure to schedule your tee time according to the restrictions. At a maximum length of 7,215 yards with a Course Rating of 74.3 and a Slope of 130, The Links at Greystone has a championship-caliber layout worthy of Golf Digest’s coveted 4.5 Star Rating. Only a handful of other golf courses across the country have ever been rated better. It’s easy to see where The Links at Greystone got its name. 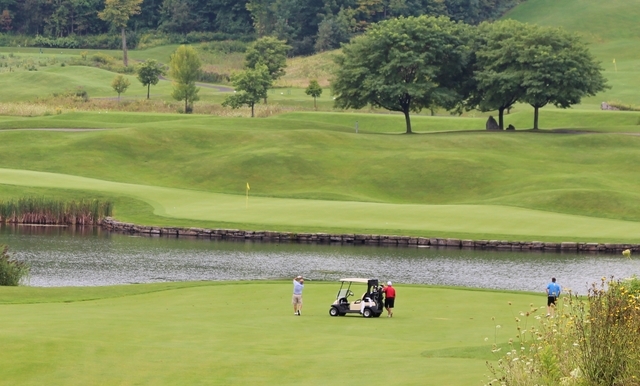 The grey stones framing the water’s edge at the golf course’s most dramatic holes, the Par 3 Hole #6 and the Par 4 Hole #18, stare back at players in defiance, demanding they hit a quality shot or enjoy the swim. If you haven’t got out to play Greystone yet, YOU NEED TO!